Libraries use social media for a whole range of objectives these days, to communicate and promote information, events, and generally build community. How well this is done of course depends on a range of things – in particular the skills and knowledge of those who establish and drive the various initiatives. It helps to have information to have a white paper to look at for general applications, as managers often respond favorably to evidence quantified this way. A white paper from Taylor & Francis from back in October 2014, which I have just stumbled across, is one such useful document. The white paper titled Use of social media by the library: current practices and future opportunities was researched and compiled to provide an overview of current practices relating to the use by libraries of social media, from a world-wide perspective. 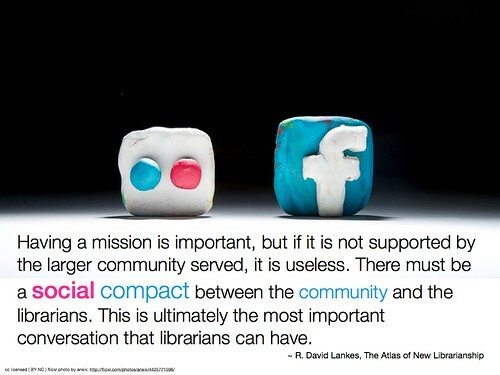 Social media has the potential to facilitate much closer relationships between libraries and their patrons, wherever they are based, and however they choose to access library services and resources. The document provides a useful benchmark, if you are still developing your strategy, and covers key areas, that I find are often missed in peoples thinking. Knowing not only social media objectives, but also how to choose channel applications, and co-ordinate approaches between them is critical for a social media presences. Good policy is also vital! Visit the Taylor and Francis LibSite http://www.tandf.co.uk/libsite/whitePapers/socialMedia/ where you will also find visualisations of key findings from the white paper. There is also a webinar to help you discover best practice (including a transcript of the session) and you can Read the Storify to see what the library community has made of the white paper results. But wait – there’s more. You will just have to go and visit the Libsite! This entry was posted in Libraries, Library 2.0, Social Media, Social Networking and tagged white paper by Judy O'Connell. Bookmark the permalink.